SOLD! Multiple Offers!!! Old World Charm meets modern amenities! This WELL-MAINTAINED home combines the character of the original woodwork (incl. original Hardwood Floors, Wood Doors, Trim, Stair Railing & Built-In Pantry!) with extensive updates throughout...including a whole-house GENERATOR (installed approx. 2015). Additional recent updates include Peerless Gas Boiler w/Economizer (2009), HW Heater (2009), Deck Addition (2018), Driveway (2011). Earlier updates include Vinyl Windows, Full Bath, Kitchen, and Washer/Dryer. This home also features a 1-car detached Garage with Garage Opener+Remote Control (approx. 2011). 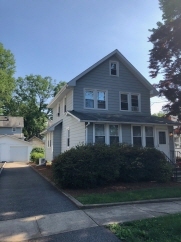 Quiet tree-lined street with CONVENIENT location near Park, Schools, NYC express Bus & Train! ......btw......did we mention this home has a WHOLE HOUSE GENERATOR!.....This one will go fast!